Thompson-Ames Historical Society’s Heritage Arts Bees usually are held the 3rd Saturday morning of each month. However, this month’s Bee will meet on October 22nd, a week later than usual. This month’s Bee, arranged by Carol Anderson, will feature Carol Dale’s presentation “The Heritage Art of Rug Hooking”. Carol Dale will bring some of her hooked rugs as well as her enthusiasm to the gathering, which will take place in Grange Hall at 8 Belknap Mountain Road in Gilford Village, from 10:00 a.m. until noon. The public is invited to attend. The morning’s presenter will talk briefly about the history of hooked rugs and then give a demonstration of how they are made. 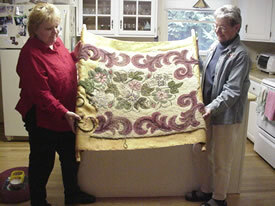 Attendees will be encouraged to try their hand at pulling some loops, using a modern rug frame to hold the backing taut. On display will be samples of the wool fabrics that are used, as well as designs, a variety of rug hooks, and rug hooking books and magazines. Carol points out that many items, in addition to rugs, can be made using hooked rug techniques, such as table runners, Christmas ornaments, pins, and “mug rugs” (coasters) – to mention just a few of these delightful and whimsical items. As Thompson-Ames Historical Society invites the public to gather in Grange Hall on Saturday morning, October 22nd for another fun-filled Bee, it seems appropriate to share a bit of biography about Carol Dale. Carol Dale has been rug hooking for over 20 years, first using her grandmother’s hand-made oak frame, her hooks, dyes, and wool. She hand cut the strips for her first 3 rugs before buying a time saving strip cutter. Carol has attended many Nw England rug booking workshops and camps, including Northern Teacher’s Workshop for the Pearl McGown Guild. Carol’s rugs have been shown at various NH fairs, including Rochester Fair, Deerfield Fair, and Sandwich Fair. She participated in a hooked rug show last year at the Holderness Library, and then demonstrated rug hooking there several days per week for 3 months. Her rugs were displayed at B.Mae’s Emporium in 2004 and now are displayed and for sale at the Village Artists Gallery in Ashland, NH. During the past year, several newspapers and publications have featured her and her work, including the Citizen, the Laker, Record Enterprise, and the Weirs Times. On Saturday, October 29th at the Moultonborough Methodist Church, Carol will be demonstrating rug hooking at Wool Crafts Day – an event that Thompson-Ames Historical Society will participate in to demonstrate rug braiding! Plans for the autumn of 2006 include Carol Dale’s putting on a hooked rug exhibit at the Belknap Mill, while more immediate plans call for Carol to offer rug hooking in Gilford Village in Grange Hall in early 2006. Thompson-Ames Historical Society is pleased to be able to involve Carol Dale to spot light rug hooking as one of the Heritage Arts. More information about Thompson-Ames Historical Society is available on the Society’s website www.gillfordhistoricalsociety.org.